It was a (surprisingly) quiet Friday evening when D and I met up in La Nuova Pastelleria. It was the kind of evening where not all tables were filled up. The room had just the right quiet volume of murmuring, and the lighting set the mood for relaxation. It almost felt like being home on a cozy rainy evening sans the rain. Perfect for some hot, comforting, and delicious homecooked meal. Which is what I have always loved about Pastelleria. It’s been a good 8 years since I’ve been here and, at first glance, I was happy to see that not much has changed. The interiors look the same. The staff still friendly but not overwhelming (i.e. They’re there only when you need them. I did not have to stop my intimate conversations intermittently as the staff fusses over us.). The menu is still familiar with some new additions to the roster. And so we order. D orders the parma ham with some cheese and grapes. Am not much of a fan of any kind of ham, but D seems to be satisfied. I eat just to fill my tummy that’s beginning to growl. Then come our soups. Wow. 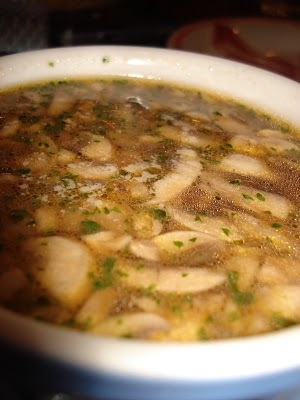 The Zuppa di Funghi (below Php200) lives up to its promise of being a fresh mushroom soup. I am happy to taste that the broth is flavored with the sweetness that can only come from fresh mushrooms (I count 3 fresh mushrooms used! ), freshly chopped parsley, and enhanced by just a hint of sugar. None of the Knorr cube broths here. Thanks goodness. 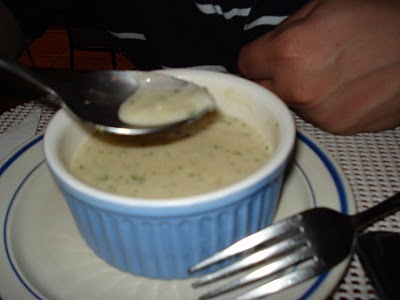 Then I make a beeline for D’s order, the Zuppa Cipole (below Php200) or onion soup. If D didn’t like his soup so much, I would’ve offered to finish it for him. This is my first time to try an onion soup that is in cream form rather than the widely known clear soup. Its creaminess is just right, not too buttery nor milky nor floury. What grabs my palate’s attention is the linamnam (Tastiness is the closest English word I can come up with) that lingers long after the soup leaves my tongue. I realize this is because of the right amount of butter used and just the right caramelization of the minced white onions that makes this soup memorable at first taste. In synchronized, brief, but big bursts of flavor, you taste light cream, then butter, then sweetness, then meaty flavor, then you want more and more. Then comes the main course. There is nothing to complain about the pizza as it is made well, but it is not outstanding. It reminds me of a student who follows instructions to the letter and does not take the risk to put in his own mark of creativity nor passion. 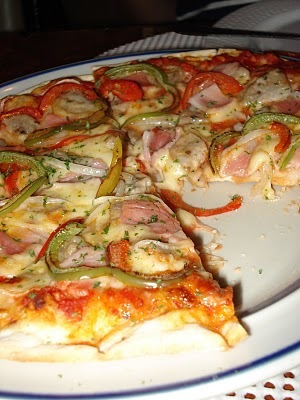 We ordered a basic pizza named Laloka (approximately Php300) which had that homemade Italian crust, but, with the smattering of homemade Italian pizzas around, I wouldn’t put my bet on this one. Ah the Ravioli Verdi (below Php300). “A House Specialty” claimed in the menu. I have yet to like a dish that a restaurant claims to be its specialty. Pastelleria is not an exception. 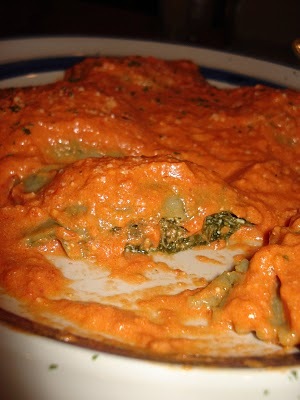 Separately, the spinach ravioli and its tomato cream sauce are good. Very good. The ravioli has a good bite and I am delightfully surprised when I taste how fresh the spinach filling is! No overcooked spinach compensated by the strong cheese here. The tomato cream sauce is addicting. I like my tomato cream sauce tangy with just a hint of cream, which is what I find in Pastelleria’s version. But the ravioli and the tomato cream sauce just don’t jive together. The tomato cream sauce overpowers the ravioli, making one think that all you’re eating is merely spaghetti in tomato sauce. I am tempted to scrape off the tomato cream sauce and save it for later. And for the ravioli, I am sure that it will go well with the Zuppa Cipole as sauce. I did no such thing, but I did my best to separately eat the ravioli and the tomato cream sauce to be just to both components. Finally, dessert arrives! There are a number of interesting desserts that I wanted to try, but D insisted on trying their canonigo. The Canonigo redeemed what, for me, would’ve been a plain Italian meal. Pastelleria’s Canonigo had the usual components of a soft “cake” made with eggwhite and the eggyolk tucked into the sauce, but that’s where the usual ends. What I love about their Canonigo are 2 things: (1) The eggwhite “cake” is not the usual saccharine sweet cake and its crust is different. The usual way is to bake the “cake” until the top and side layers are toasted. The crust reminds me of those meringue kisses that I’d buy in bakeries as a kid. It so complemented the eggwhite “cake” and gave it that added crunch to the soft and easy-to-melt-in-the-mouth cake; (2) Instead of just using eggyolk as its sauce, Pastelleria uses fresh cream and mixes this with a bit of eggyolk. This results in a Canonigo that has the just right sweetness for dessert, finished with a refreshing taste of cream. Oh yumminess. I am shocked that the total bill is at Php1,600 (VAT inclusive). I am a believer that food should NOT be scrimped on, but the lukewarm satisfaction I got from my meal was definitely not commensurate to what I paid for. I’d think twice about eating here again, but, heck, I’d go back for the Zuppa Cipole and Canonigo any time of the day. All things are relative. In this case, relatively expensive. Finally, I was waiting for the 3rd shoe to drop so to speak. Plus, you were the only one to have the Canonigo?! That's the only reason I go to Pastelleria. Otherwise I go to my neighborhood Italian restaurants along Pasong Tamo Extension, and Reposo. The picture of that canonigo is so tempting! Does anyone else think it looks like a big white tongue? i really like the concept for your blog- 3 different takes on one venue. i havent eaten in pastelleria in a couple of years and the prices havent changed much-still a lot to pay for what you get. but that tongue-like canonigo looks interesting :-) cheers! I haven't tried their canonigo, but it does sound (and look) the way I like canonigo to be. However, for me Pastelleria (still can't get used to calling it La Nuova) has always meant Concorde. I believe they were the first to serve this cake, and I still think theirs is the best version there is, bar none. Katrina - Thanks for the tip! Will make sure I try their Concorde next time (It's one of my fave cakes!). Oops! I just remembered today that another Concorde has displaced Pastelleria's on my list: Patty Loanzon's. But if you can't get hers (you have to pick it up from Sampaloc or something like that), then Pastelleria's the place to go. Katrina, I'm with you on the Concorde! Just the other week, the owner was telling me how yes, they were the first to offer that cake, and so many have tried to copy it. Red Ribbon tried hard but never succeeded. I still love it today as much as I did before and I'm so glad they never removed it from the menu. Hi, Katrina! Is Patty Loanzon's Concorde better than Jill Sandique's? Concorde is one of my most fave pastries! Would you be willing to share Patty's contact details? Please?